Q: Dr. Roger, thank you for helping me get back on my feet after my broken hip last year. I am back to doing my usual activities, but I am afraid of falling again. What is the best way for me to prevent another fall and hip fracture? A: We naturally become more prone to falls and hip fractures as we age. The increased risk of fall and subsequent fracture is due to a variety of factors including loss of bone and muscle strength, common medications, and certain medical conditions. The first step in preventing hip fractures and falls is to maintain your bone and muscle strength. Try to engage in physical activity on a daily basis. Walking, swimming, and even Tai Chi are good exercises for improving strength and balance. You should also eat a healthy diet rich in calcium and vitamin D. It is a good idea to consult your primary care doctor about getting a bone density scan to check for osteoporosis. A bone density scan is similar to an x-ray and is completely painless. If you do have osteoporosis, you primary doctor may want to start you on medication to prevent further bone loss. Finally, you should avoid smoking and drinking excessive alcohol. The second step to prevent a hip fracture is to focus on safety. Reduce clutter and keep all pathways clear. Make sure your home is well-lit. Install two-way switches at the top and bottom of stairways. You should also have nightlights in all rooms and a flashlight by your bed. Rearrange closets and cupboards so frequently used items are within easy reach. Install grab bars in your bathroom and a non-skid mat in the tub. Avoid walking on sloping or uneven surfaces if possible. Consider using a cane or walker when walking outdoors. Stop before stepping off a curb so you can assess its height. Be extra cautious in public buildings with highly polished floors. Try to walk on a carpeted runner if possible. You should be aware of any medical conditions you may have that can increase your risk for falls. Vision or hearing loss Common medications such as blood pressure pills, diuretics, heart medications, and muscle relaxers or tranquilizers can cause dizziness or drowsiness and make you more prone to fall. If you take these types of medications, make sure you stand up slowly and avoid sudden changes in direction to avoid becoming too dizzy. Paying attention to your bone health and creating a safe environment are the keys to preventing hip fractures; however, you need to be prepared should you experience a fall. Try to keep a cordless or cell phone within easy reach, especially when walking outdoors. Walk with a buddy when outdoors, or at least make sure someone knows where you are going. Consider signing up for a medical alert service. Arrange for a friend or family member to check on you daily. Falling forward or backward may help prevent a hip fracture. Landing on your hands or grabbing something to break the fall may prevent a hip fracture. A broken wrist is a lot easier to recover from than a broken hip. If you are considering hip surgery or have questions about the procedure make an appointment today to see Dr. Roger. He is a leading orthopedic surgeon with a proven track record for minimally invasive hip surgery. 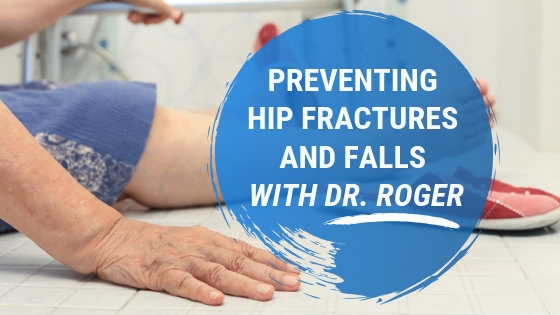 Let Dr. Roger help you live pain free and get back on your feet! Learn about the Direct Superior Approach Hip Replacement Surgery. If you would like someone from the office to give you a call to make an appointment fill in your information below.